As the greatest event in the football calendar finishes for another four years the entire world has been treated to a viewing spectacular. Widely considered to have been one of the most exciting World Cups, the holders, Spain, crashed out in the group stages with the hosts, Brazil, collapsing in a 7-1 thrashing against eventual victors Germany. The build up to this tournament, however, was in utter contrast to the success it will likely be remembered as. Official estimates predicted less than $1 billion spent on stadium construction, Forbes puts the actual figure closer to $3.5bn with Bloomberg calculating, all costs considered, the bill rising to over $14.5bn. 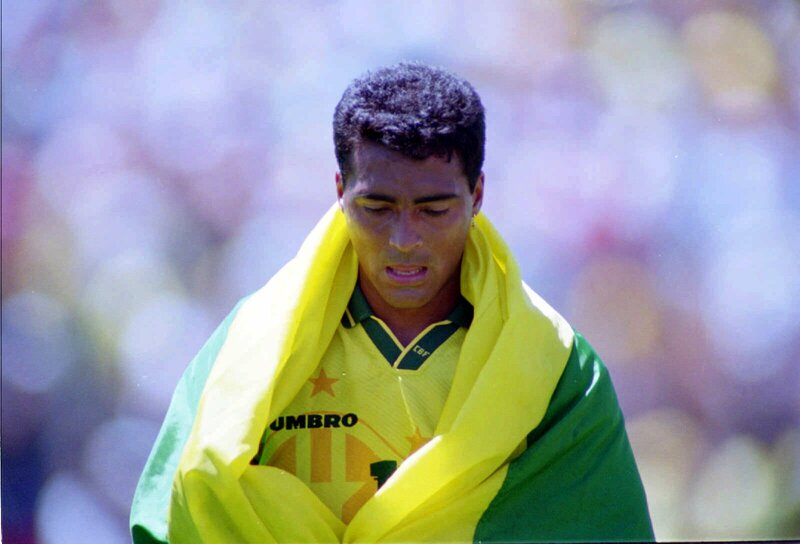 Romario, one of football’s greatest players and now a parliamentary deputy for the Socialist Party (Partido Socialista Brasileiro), puts the total cost at a staggering $46bn. 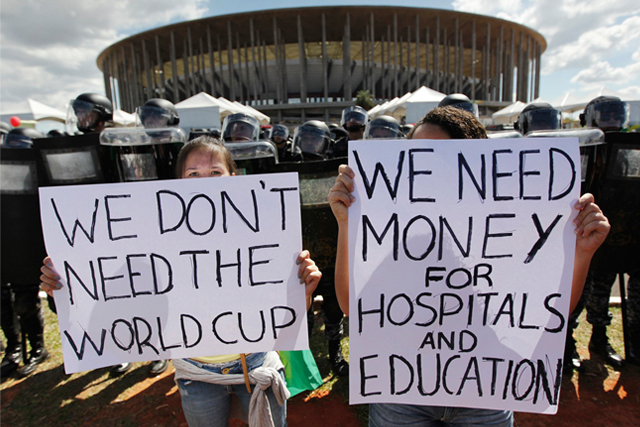 He slammed the World Cup asking why the Brazilian people could not have “FIFA-standard schools and hospitals” whilst billions were found for white elephant stadiums. The Brazilian government sold the World Cup on the basis of national redevelopment with promises of private sources funding significant investment. Neither happened, leaving the Brazilian people to pick up the massive bill. This was not isolated to Brazil however. Similar things occurred in South Africa four years ago. The World Cup would provide a much needed to boost to the local economy and small businesses, FIFA and the government claimed. Just prior to kick off however it was announced that non-FIFA approved vendors (i.e. those small businesspeople meant to benefit) would be banned from selling in the vicinity of stadiums. It is hard to not come to the conclusion that this was to protect the profits of the “FIFA corporate family”. The senators and emperors of Ancient Rome had a famous phrase: “bread and circuses.” Keep the people fed, keep them distracted, and those in power can continue their corruption and profiteering uninterrupted. What better than the World Cup footballing feast? And riot police of course. Tens of thousands of heavily armed and armoured riot police. Indeed the before the Sunday’s Final 24,000 police were on duty throughout the city, a huge number, and dozens of activists were arrested and held, without charge, in preventive detention as they had been for the opening game as well. In the years before the tournament Brazil was rocked by massive protests and huge social unrest. These protests focused on the inequality of Brazilian society, poor housing and increasingly expensive public transport. Endemic corruption was perceived as rife, triggering a loss of faith that established politicians and existing institutions could fairly solve (or were even interested in) these problems. The World Cup became the focal point for these protests, with almost every section of Brazilian society participating at some point. At times these protests even threatened to break out into full scale civil conflict. 100,000 protested in Rio de Janeiro on 17th June with 120,000 in Belo Horizonte on 26th June and millions across the rest of the country in a succession of demonstrations. Police used arrest, tear gas, rubber bullets and even live ammunition, with three protesters going to hospital with gunshot wounds, to control the streets. Some reductions were won in the cost of public transport by the mass demonstrations, and MTST (Movimento dos Trabalhadores Sem Teto/Homeless Workers’ Movement) won an agreement for new housing projects in Sao Paulo. However the underlying problems that caused the protests remain, a deeply divided and unequal society governed by an out of touch, self-interested political and business elite. As FIFA and its World Cup move on (to Russia and Qatar next) it leaves behind yet another example of the public purse being plundered by a very narrow set of interests. Like a whole host of other institutions across the world there have been very definite winners and very definite losers. The winners, most certainly, were not those Brazilians in the favela.